'I look up into the night sky, I see a thousand eyes staring back. Who remembers Sam Sparro's Black & gold? I'm hoping some of you might remember it so my name for this looks makes sense, otherwise you're probably just thinking that three black and golds is a little excessive! Anyway, as I was working on this design this is what kept popping in my head, so I thought why not use it as a name. I think it's still a little too early for Christmas nail art designs (although I have so many ideas I will probably need to make a start soon) so I decided to go for a design I've wanted to do for a while but had put on hold until the Halloween nail art was out of the way. This one was inspired by a picture I found somewhere, but for the life of me I can't remember where I found it now. I know it wasn't Pinterest (I'm currently slightly obsessed with Pinterest, you can find me here) as I'd have just pinned it to my nail art board, but instead I had to save the picture. It's really bugging me now! I think black and gold look amazing together and as I've just got my hands on the new Nails Inc Alexa Silk nail varnish I thought this would be a great design to try it out on. I will write a full review of Alexa Silk as I have a few things to say about it. For this look I also used Orly's Luxe, which was a recent magazine freebie, and Max Factor's Max effect mini nail polish in Ivory. I think I've commented before on the fact that this shade is called Ivory when it's quite obviously a gold shade! 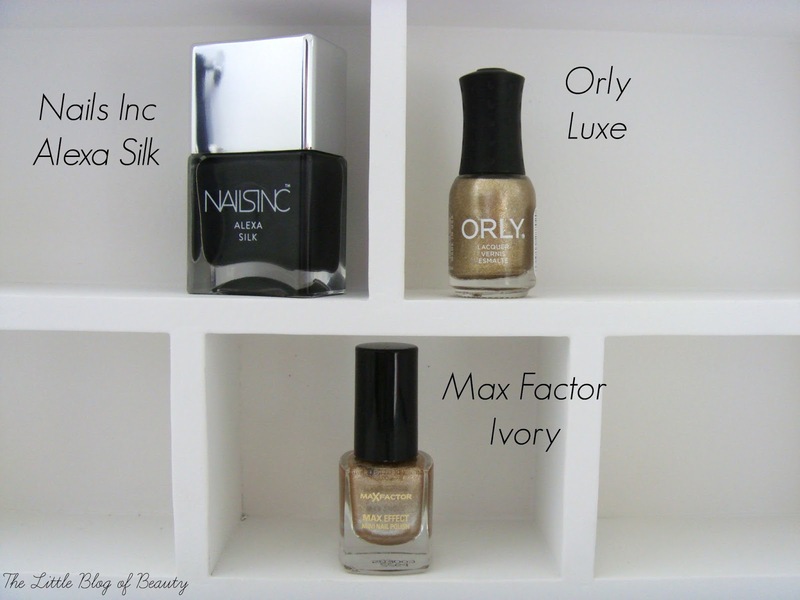 As always I started off with a base coat and then I applied Max Factor's Ivory to my thumb and middle finger and Orly's Luxe to my index, ring and little finger. For the ring finger and the bits peeking out from under the black I really wanted a proper glitter gold, but I don't actually have one, so that was why I used two different golds to try and create a distinction between them. I then took my smallest dotting tool and used Alexa Silk to create the dots on my thumb and middle finger. Using stripping tape I then applied two pieces across my index finger and one across my little finger, painted over both of these nails with Alexa Silk, and then removed the stripping tape immediately while the polish was still wet. After leaving everything to dry for a while (to try and avoid any smudging) I then applied a top coat to all nails to seal everything. What do you think black and gold? I remember the Sam Sparro song, you're not alone. I wouldn't usually go for black & gold nails myself but tours look stunning so I may have to reconsider. I got the song too! These nails look awesome :) I wanna try out something like this! Totally sang the title. Love Black and gold together. Definitely my favourite nail combination for christmas.